One day, Kenneth Lovell went to a local electronics store to buy a transistor radio. He left the store more than $17,000 in debt, with three bank credit cards issued in his name. How did this happen? 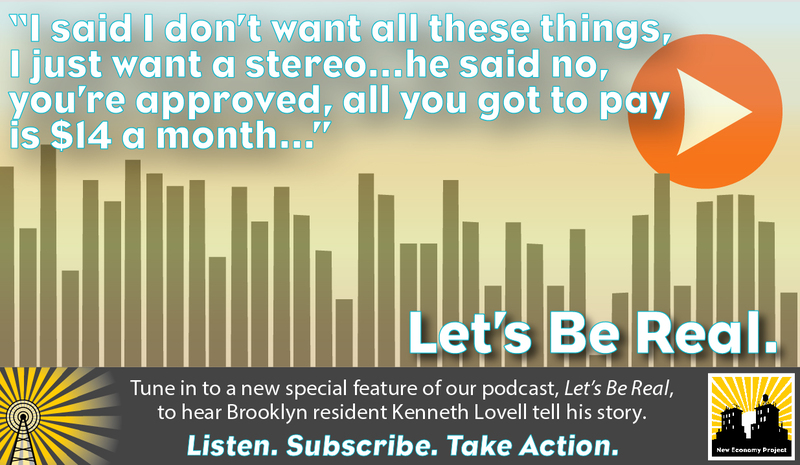 Listen to Kenneth and his brother Patrick Lovell tell their story. Unable to read or write beyond a 1st-grade level and feeling overwhelmed by the situation, Mr. Lovell signed documents put in front of him. Only after Mr. Lovell started receiving credit card statements from three different banks – TD, Synchrony, and Citibank – did he come to understand that he had been signed up for three different credit cards, with combined monthly payments of more than $500 – a sizeable portion of his total monthly income. Although the store’s employees clearly took advantage of Mr. Lovell, their scheme was possible only because Wall Street banks were willing to approve and issue him credit cards in minutes — without any meaningful underwriting or review. What happened to Kenneth Lovell is part of a disturbing pattern we’ve been seeing on our NYC Financial Justice Hotline. Like Mr. Lovell, callers to our hotline discover after the fact that retail stores, doctors’ offices, and others signed them up for credit cards without their full knowledge or consent. Like Mr. Lovell, they don’t know big banks are even involved in these transactions until statements show up in the mail. These credit cards often carry high interest rates, sometimes in combination with deferred-interest promotions that can be confusing and deceptive. Like so much other consumer financial fraud, this scheme directly undermines low-income New Yorkers’ financial security and overall stability. In the case of Mr. Lovell, the scheme led him to lose his apartment, forcing him into the NYC shelter system. This is just one more way that banks systematically exploit people of color, immigrants, women, and seniors, and we appreciate Mr. Lovell’s sharing his story as we work to expose and fight this exploitation.